To judge from these comments, it would appear that colleges and universities have become virtual petri dishes of Jew-hatred. Have our campuses indeed become overrun by anti-Semitism? I would argue that something very different is going on. As the movement for Boycott, Divestment and Sanctions against Israel grows and student divestment campaigns increasingly find traction throughout the United States, we’re witnessing a new kind of tension forming between Palestinian solidarity activists and Israel advocates on college campuses. And while it doesn’t surprise me that some Jewish community leaders are raising the all too familiar cry of anti-Semitism, I believe it’s critical to carefully examine the context that lies beyond the hysteria. Some background: the UCLA incident occurred last February, when a student candidate for the Judicial board of the Undergraduate Students Association was asked by a student member how, given that she was Jewish and affiliated with Jewish campus organizations, would she “see (herself) being able to maintain an unbiased view?” After a subsequent discussion, the council first voted to reject her nomination – but after a faculty adviser pointed out that it was not appropriate to view a student’s affiliation with Jewish organizations as a conflict of interest, the students voted again and unanimously approved of her nomination. This incident, which was captured on video and posted on YouTube, led to an intense and at times painful reckoning throughout the UCLA campus community. The four students who initially opposed the student’s nomination wrote a public apology in the campus newspaper, stating that their “intentions were never to attack, insult or delegitimize the identity of an individual or people” and that they were “truly sorry for any words used during this meeting that suggested otherwise.” UCLA’s chancellor, referred to the incident as a “teaching moment.” Later, the student council unanimously passed a sweeping resolution condemning anti-Semitism. Many observers have referred to the board members’ line of questioning as “anti-Semitic,” claiming that their questions raised the infamous anti-Jewish tropes of dual loyalties. 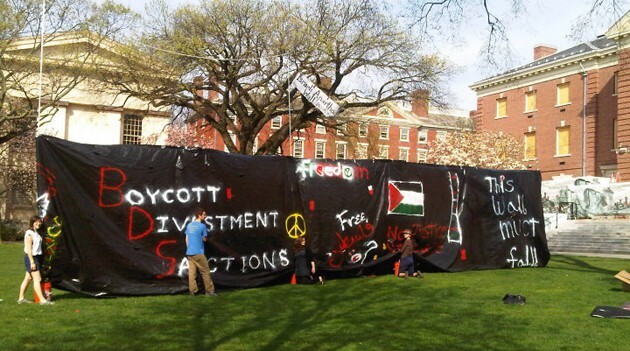 But whether their comments were anti-Semitic, obnoxious, or merely naive, it is important to note that in the charged world of campus divestment politics, attitudes toward Jewish students – particularly those who serve on student boards – do not exist in a vacuum. To begin with, any serious analysis of this issue must factor in the heavy-handed interventions of off-campus advocates of Israel into student politics. Perhaps the most infamous example is Adam Milstein, a businessman and convicted felon who is connected to right-wing Zionist groups and has reportedly funneled money through UCLA Hillel to influence student elections and oppose divestment campaigns. For at least the past three years, Milstein has donated funds via UCLA Hillel (another comprehensive review of the entire scandal is here) to support the pro-Israel student government slate Bruins United, an affiliate of Bruins for Israel. Though we know that Milstein personally donated $1,000 to the slate (e-mails confirming this are published here), he also solicited funding from other pro-Israel donors. Both he, Hillel, and the slate have refused to reveal how much external funding was given. Milstein was much more than a mere donor. He held strategy sessions with the executive candidates. He held a gala fundraising event at his home attended by Hillel staff, prospective donors, and UCLA faculty and staff. The purpose was to encourage donors to participate in the project to benefit both Hillel and Bruins United and to oppose BDS. In addition to individual actors such as Milstein, there are many Jewish institutional initiatives (such as AIPAC Campus Initiatives, Hasbara Fellows, the JNF Campus Fellowship Program) that receive direct support from the State of Israel to train students to advocate for Israel and combat divestment initiatives. Last year, in fact, the Judicial board of the UCLA Undergraduate Students Association heard a complaint that two student government members had taken trips to Israel sponsored by the Anti-Defamation League and the American Jewish Committee prior to voting on a student divestment resolution. Although this context has not been widely reported, it is crucial to our understanding of the most recent incident involving the questioning of the student Judicial board candidate. Given the high profile of professional Israel advocates in student affairs, it is fair to assume that these interventions might well affect attitudes and assumptions about the loyalties of Jewish students at UCLA. Having said this, it would be a mistake to characterize these campus tensions in simple binary terms as a conflict between Jewish students and Palestinian solidarity activists. In truth, there is a significant and growing percentage of Jewish students actively participating in campus divestment campaigns through Students for Justice in Palestine and student chapters of Jewish Voice for Peace. I know first hand that many of them are motivated to their activism by their deeply held Jewish values of justice and the dignity of all. I took it as something of a sign of the times when just a few months ago, I was contacted by a undergraduate at Northwestern University who grew up in my congregation. This young man, whom I had not seen since his Bar Mitzvah, told me he was involved in the student divestment campaign and invited me to speak in support of it on campus. By the same token, it would be mistaken to assume that all campus Israel advocates are necessarily Jewish. There are for instance numerous Christian Zionist campus groups that work alongside Jewish Israel advocates, the most prominent of which is CUFI on Campus – the student affiliate of Pastor John Hagee’s Christians United for Israel. As anti-Semitic activity on American college campuses has steadily increased, CUFI recognizes that Christian students have a responsibility to speak up on behalf of Israel and the Jewish people.Field Organizers travel the country actively developing student leaders. Our Field Organizers travel the country actively developing student leaders to ensure they have the skills, resources, and guidance they need to do this successfully on their campuses. Anyone familiar with the right wing Evangelical theology of Christians United for Israel might well find it puzzling that CUFI on Campus is concerned with rising anti-Semitism on college campuses, particularly when you consider that CUFI Pastor John Hagee has long preached that the Holocaust was God’s will, that the Jewish people need to accept Jesus to avoid going to hell, and that the contemporary Zionist settlement of Israel is a necessary precursor to Armageddon. Given these realities, I would suggest we avoid simplistic narratives that blame Palestinian solidarity activists for creating an “unsafe environment” for Jewish students. The truth is that there are Jewish students and non- Jewish students on both sides of this issue. We should also think seriously about what we mean by the term “unsafe” – an oft-heard complaint of Jewish Israel advocates on campus. I have no doubt that some Jewish students are uncomfortable with divestment resolutions and other actions employed by Palestinian solidarity activists. I also have no doubt that on occasion such actions might spill over into the inappropriate or offensive. But as a rabbi who has worked together with activists from SJP and JVP on several campuses over the years, I can personally attest that I have found these student leaders to be smart, passionate organizers who are motivated by deeply held anti-racist values – and who understand full well the difference between anti-Israel and anti-Semitic. And if, on occasion, the line between the two sometimes get blurred, we might well ask ourselves: is this due to the abject Jew-hatred on the part of Palestinian solidarity activists or a contemporary Jewish communal mentality that has placed support for the State of Israel at the center of Jewish identity? In its audit of 2014, set to be released April 1 and shared with the Forward, the ADL said there were 47 incidents of anti-Semitism on campuses nationwide, where hundreds of thousands of Jews study. The number organically fluctuates year to year … but this is one trend that’s unmistakeable. Overall, anti-Semitic incidents are at the lowest point in 15 years. The reality is that, for every real incident of anti-Semitism on campus, Palestine Solidarity Legal Support has documented many more false accusations aimed solely at thwarting serious discussions about Israel’s treatment of Palestinians. In 2014 alone, we documented over 240 incidents of repression and requests for legal advice, nearly 75% on campuses. These ranged from disciplinary actions against students for peaceful speech activities, to attempts to cancel events, to smear campaigns against groups, students and professors, to death threats and anti-Arab and Islamophobic slurs and assaults against activists because they voiced their views. Virtually all of these cases resulted from unfounded accusations of anti-Semitism and unrelenting pressure from Israel advocacy groups to censor and punish those organizing and engaging in speech activities advocating for Palestinian rights. So far this year, we have already documented over 80 such cases, 40 of which occurred in California. In the end, I would suggest this concern over the “new campus anti-semitism” is really a red herring. Anti-semitism, like all forms of racism should certainly be condemned and stood down in no uncertain terms. But for all the concern over anti-Jewish attitudes, it is worth noting that Jewish students and Israel advocates face absolutely no institutional restrictions to their cause or to their freedom of speech on campus. It is far from clear that the same could be said for students who advocate on behalf of Palestinian rights. This entry was posted in American Jewish Community, Anti-Semitism, BDS, Human Rights, Israel, Palestine, Zionism on April 20, 2015 by Rabbi Brant Rosen. Thank you for exploring this important topic. I am thankful for voices like yours, Rabbi. You are a living demonstration that Zionism is NOT synonymous with Judaism, however much certain elements would like the two things to be conflated. I’m glad your little sidebar blurb draws a distinction between Judaism and “social justice.” Of course, Judaism has it’s own idea of social justice, but yours holds the two in tension. What you do not seem to realize is that your invention of this social justice is antagonistic to Jewish values and especially rabbinical values. No one ought to like the rabbi who tries to pontificate about the world, except in a way that is grounded in the rabbinical tradition. At least it seems like you aren’t too popular. The claim that BDS is not anti-Semetic is an insult to intelligence. If it was anything but anti-Semitic, it could be broader in focus. But why is it that all these concerned students at UCLA care so much about Palestinians? By the numbers, it’s far worse to be in North Korea, China, parts of central Africa, etc. What is this fascination with Israel and Palestine. Well, temerity is cheap nowadays and you’re no exception, even if your cheeky, pseudo-intellectual rant above is chutzpadik. The reason we care about Palestine is that we are complicit, through our support of Israel, and that we can do something about it. If America pulls its funding of Israel and stops vetoing security council resolutions, the abuses would have to stop. In contrast, there’s relatively little we can do about North Korea, China, parts of central Africa, etc. Also, it really is pretty bad if you look into it. House demolitions, violent midnight raids, uprooting olive groves, detention without trail, explicitly legal torture (most democracies feel the need to try to hide it when they torture – the Israeli supreme court says it’s ok), waiting at checkpoints for hours, even people who need medical care, harrassment and murders from settlers, the list goes on and on. Imagine living like that, never knowing when your house will be bulldozed or when the door will be kicked in at midnight and your children will be pulled out of bed with guns pointed at them and screamed at – if you’re lucky. If you’re not lucky, your children will be hauled off to secret prisons and beaten up. If you look at it without blinders on, you have to see that it’s bad. Thank you so much for this great piece. I was raised in a dual French-German education system, meaning that we studied the Holocaust in much depth both in French and German history classes, as our teachers’ generation was the generation who needed to understand, having grown up with parents who repressed events that they or their family might have played a part in. I remember weeping in front of my history books, wondering how human beings could be so beyond evil to other human beings. I was 13 to 16 at the time and I believe it greatly shaped my view of the world and my engagement in Human Rights and humanitarian issues as I grew older, including my engagement in favor of Palestinian rights. I am strongly and vocally against Israel’s policies and actions vis-a-vis Palestinians which I believe to be a disgrace to all of us as a community of human beings. I am NOT, nor have I ever been or will I ever be, an anti-Semitic. There is a distinction, one that makes a world of difference. 4 comments…my my…your blog has the importance and relativity of a cockroach which fits as you are a big self inflated egotistic super sized cockroach yourself…. Thank you for this great article. It makes me understand and put things that are happening at my university into perspective. I am advocating BDS at my school, but I have lately been discouraged when hearing that my engagement has made Jewish students at my school feel uneasy, (I’m also Jewish, and comments like that make me feel uneasy, I don’t like the idea that being Jewish automatically makes me have one type of opinions). But still, I don’t want to make other students uneasy, that is the last thing I want to do. (But I think I know how that feels) For me BDS is an act of solidarity, but right now I don’t know how to think and work around this. I may have to join your new congregation as a virtual member and contributor, if you accept Muslims :o). When I started opposing Israel’s Occupation and criticizing it for its treatment of “Arabs,” a lot of Jewish friends and fellow activists “befriended” me–literally. Although I have MANY new Jewish friends and fellow activists now, I’m excited about a congregation devoted to justice and other solidly Jewish ideals and practices.